Could the following people please re-enter so that I could total up your points accordingly? Thank you. For those who have entered via Rafflecopter, I'm so sorry that you have to re-enter as I'm not able to retrieve any detail of the entries. To re-enter, please go to the original giveaway blog post and re-enter by commenting under your comment, following the "template" I've included in the same blog post. 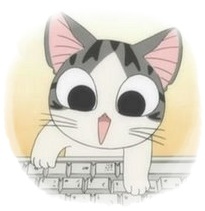 You could also refer to my individual replies to your comments to know what to do. Please refer to my replies to your comments individually and update with the steps taken in the template. I'm going on a holiday!!! Do bear with the wait. I would be overseas from 1 May onwards. Yeah, it was a slight impromptu decision. Last month, the hubz was looking at his whole year's work schedule and informed me that other than December, he only had this period of May to take leave. Hence, we scrambled to make things work out for a short holiday and we only booked our plane tickets and accommodation just 2 weeks ago. Pretty rushed but the both of us are very happy to take a break from work. In the meantime, I would try to do some scheduled posts and would probably update Instagram more often. So if you liked to see more of my "adventures", follow me on my Instagram. "Either open this page, wait for it to load and go do something else before coming back or just click the X button on the top right hand corner of your browser window and don’t come back." 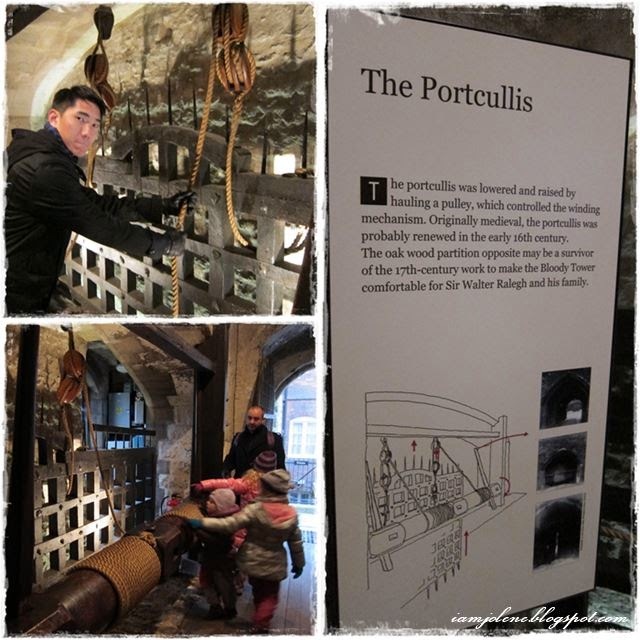 Continuing from The Tower of London Part 1, here's Part 2 where we spent most of our time at the White Tower viewing the exhibits in the Royal Armouries. Equally interesting was the Bloody Tower, along with the exhibits of torture equipment and the write up of The Royal Menagerie. As mentioned previously, I personally found the tour at Tower of London really enriching since I've always been interested in medieval history. For me, one of the most compelling aspects of being in historical places is trying to imagine what it would have been like at the time and how the people in different eras had lived there of time long past. 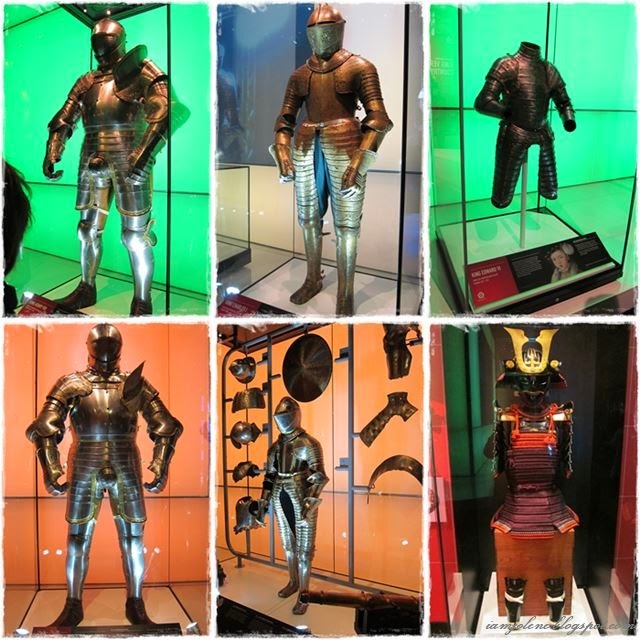 The Royal Armouries collection consisted of some 70,000 examples of arms, armour and artillery dating from antiquity to the present day. It included royal armours of the Tudor and Stuart kings; arms and armour of the English Civil Wars; British and foreign military weapons from the Board of Ordnance and MOD Pattern Room collections; hunting and sporting weapons, as well as an exceptional collection of oriental arms and armour. The White Tower was a fortress of enormous proportions, symbolic of William the Conqueror’s fierce suppression of a newly conquered capital. 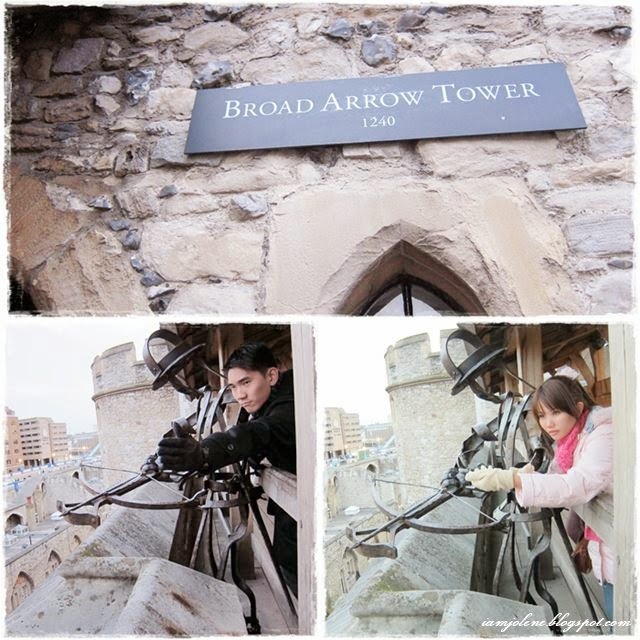 It is the oldest medieval building at the Tower. We were greeted by a painting of the Princes in the Tower upon entering the White Tower. There are many variants of art depicting the Princes in the Tower but that was the first time I saw this version. This painting looked a little suggestive if you were to ask me. I would elaborate more on the murder of the princes later on when we reach the Bloody Tower. The Fit for a King exhibition was a stark palette of LED lighting and gloss white walkways which was a striking contrast to the historic stone and oak interiors of the Tower. "Wifey's knight in shiny armour! If you look closely, I'm inside the armour...lol"
I'm not sure about you but I'm obsessed with standing near to each armour and seeing how I measured in height against each monarch. Some armour were surprisingly diminutive that I could not imagine how someone of such physical attribute could command power and respect. A pair flintlock pistols of the finest quality was possibly made for King William III. Moving forward a split second to more contemporary times. These life-sized wooden models of horses were created by King Charles in the 17th century and recently restored after a 100-year absence from the Tower. They stood with attendant royal suits of armour which are meant to represent the line of kings of England. The era where guns replaced swords during wars. Left Column: Armour of King Henry VIII. It was huge compared to the rest. I later found out he was 1.88m tall. Middle Column: Armour of King Charles I. It was one of the puniest armours and I later found out that he was only 1.63m tall! Just a cm taller than I am! Right Column Top: King Edward VI who was crowned at the age of 9 which explained the child-sized armour. Right Column Bottom: Gift armour presented to King James I by Tokugawa Hidetada in 1613. Ah, no wonder it looked Japanese. I felt like I was in a movie set where some innkeeper with a cloth thrown over his shoulder would pop up any moment. 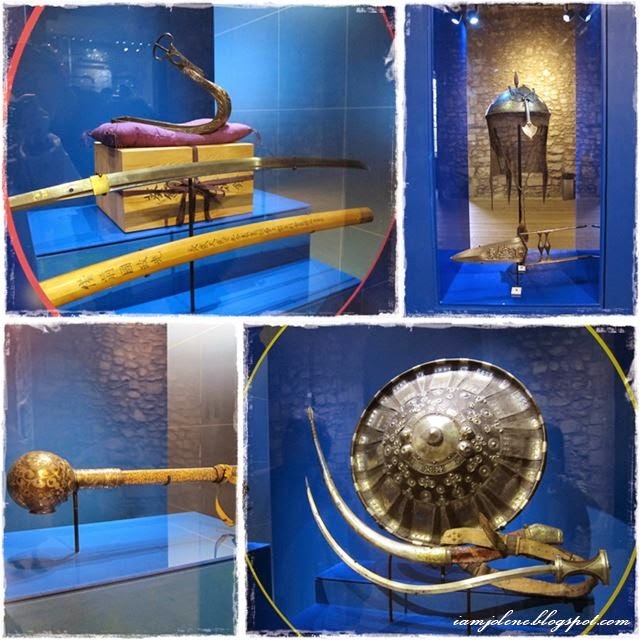 A pair of ceremonial bearing swords (only one pictured here) stood out from the rest of the exhibits simply because they exude nothing but simplicity and humility. My my, what a thick tome. This jousting lance was really loooooooooooooooong. It stretched from one end of the display cabinet to the other. A boy’s armour designed for the son of Charles I standing next to The Giant at about 2 metres. This tallest suit of 2-metre armour made it to the Guinness World Records. Some treasures sieved from River Thames. Gifts from all over the world. 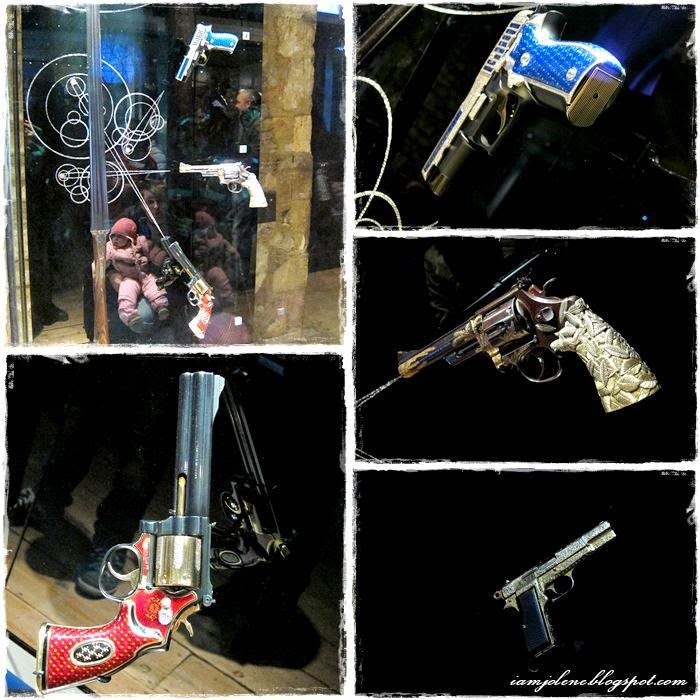 Various embellished revolvers were on display. Red revolver: Decorated with red gold, red enamel and diamonds. Blue revolver: Decorated with blue enamel panels, white gold and 1517 diamonds. Brown with gold leaves: A Smith & Wesson revolver decorated by Tiffany and Co.
Black: Looked just like a toy gun I used to have. Next up, kh was attacked by a ferocious dragon. As the centrepiece of the Royal Armouries’ exhibition at the White Tower, this dragon sculpture was both artistically grandiose and historically relevant. 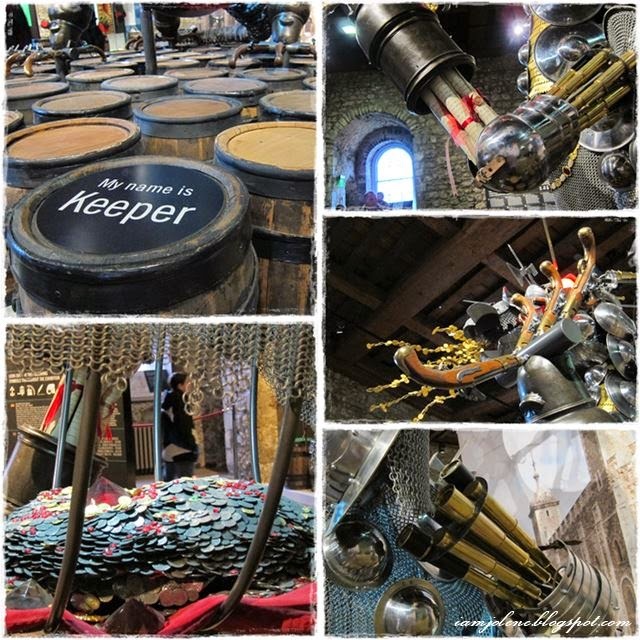 Composed of a variety of weapons including muskets, pistols and swords, the dragon was illustrative of the tradition of storing trophies of arms and armour at the Tower of London from the late 17th century. Kh and I only knew of Isaac Newton as the scientist who discovered gravity. Little did we know that he was the Warden of the Mint. Nothing educational in this photo. Just a reflection selfie of us. The Grand Storehouse keys were almost as big as those flintlocks up there. 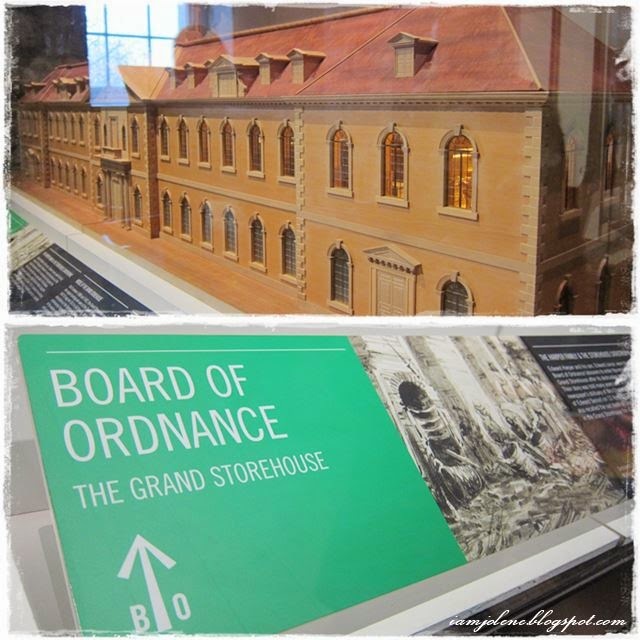 Board of Ordnance -- The Grand Storehouse. The Lion's Roar music sounded like a lullaby for the great felines. Josef Jakobs (30 June 1898 – 15 August 1941) was a German spy who became the last person to be executed at the Tower of London. You could spot the damage to the chair back from the bullets. 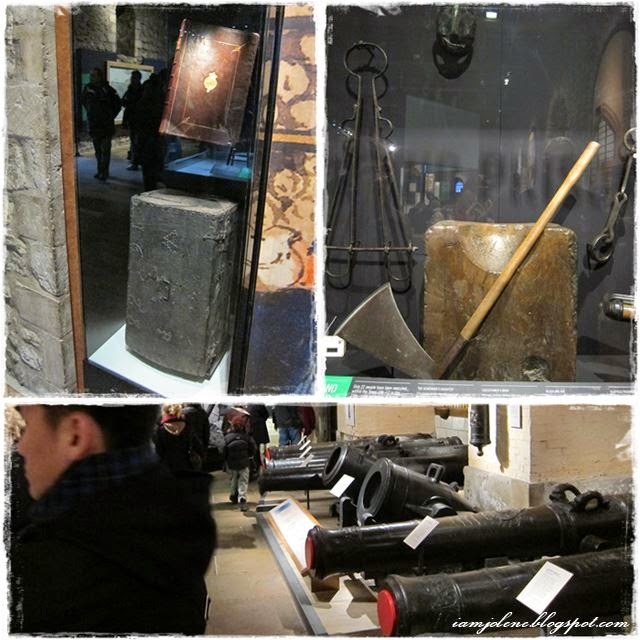 Random exhibits such as the executioner’s axe. Model of the Tower in 1882. It did felt more contemporary as we proceeded on. These are for sale??? We found them in the shop and there were label cards mentioning that one should seek assistance for purchase. A quarter to three and we were done with The Royal Armouries! 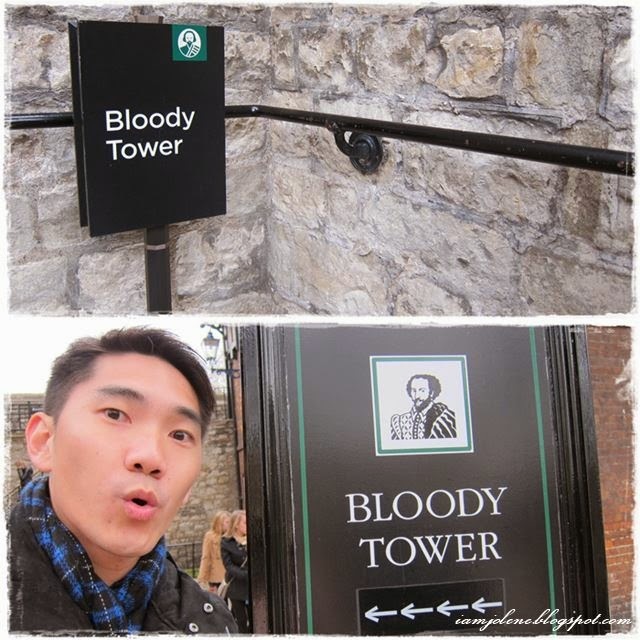 Next, we headed for The Bloody Tower. The tower became known as the Bloody Tower in the mid-16th century because it was believed to be the place where the two Princes in the Tower were murdered by their uncle Richard, Duke of Gloucester. Prior to that, The Bloody Tower was actually named the The Garden Tower. This was Sir Walter Raleigh’s room in the Bloody Tower where he was held prisoner. What a fine prison! The Bloody Tower was built at the same time as the inner ward's curtain wall, and as a water-gate which provided access to the castle from the River Thames. It was a simple structure, protected by a portcullis and gate. We were on the hunt to find out what happened to the two princes. 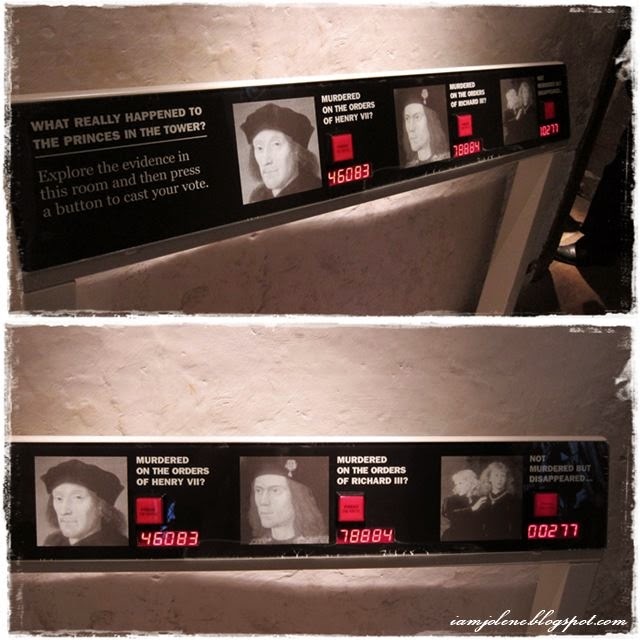 The Princes in the Tower were Edward V of England (12 years old) and Richard of Shrewsbury (9 years old), Duke of York. The two brothers were the sons of Edward IV of England and Elizabeth Woodville. They were lodged in the Tower of London by the man appointed to look after them, their uncle Richard, Duke of Gloucester. This was supposed to be in preparation for Edward's coronation as king. However, the duke was crowned King Richard III and the boys were never seen again. It is generally assumed that the princes were murdered. There were several suspects who had motives for such an action with Richard III and Henry VII being the most possible suspects. Richard III was killed in the Battle of Bosworth. The victor, Henry Tudor, was crowned King Henry VII. He married the princes’ sister, Elizabeth of York, strengthening his claim to the throne. This could have been jeopardised if the boys had survived. So what really happened to the princes? 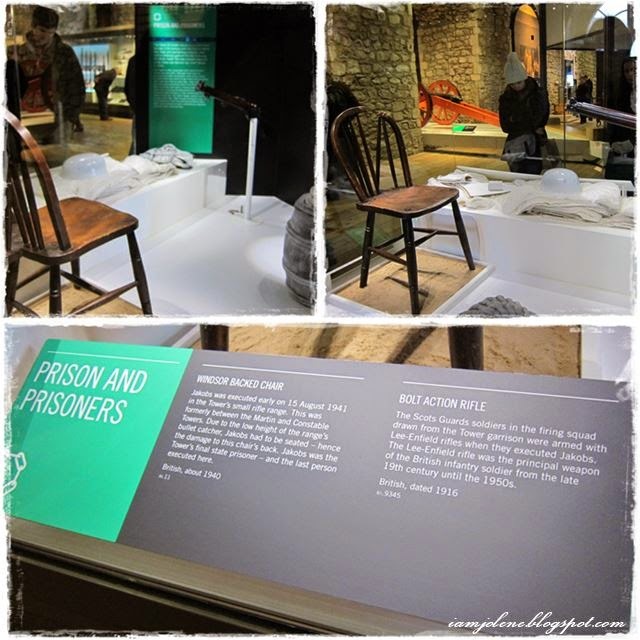 Also in the Bloody Tower was an exhibition on Torture at the Tower. I have always been fascinated by Medieval torture devices. Those on display were recreations and not the actual equipment. Replica of the Scavenger's Daughter. The rack was used throughout Eu­rope for centuries. The victim would be tied down while some mechanical device, usually a crank or turning wheel, tightened the ropes, stretching the victim's body until the joints were dislocated. Continued pressure could cause the limbs to be torn right off. Eventually, public disgust led toTthe Rack’s use being restricted and the invention of The Manacles. This was considered to be a lesser form of torture. Many prisoners of the Tudors entered the Tower of London through the Traitors' Gate. Prisoners were brought by to the Traitors' Gate along the Thames, passing under London Bridge, where the heads of recently executed prisoners were displayed. 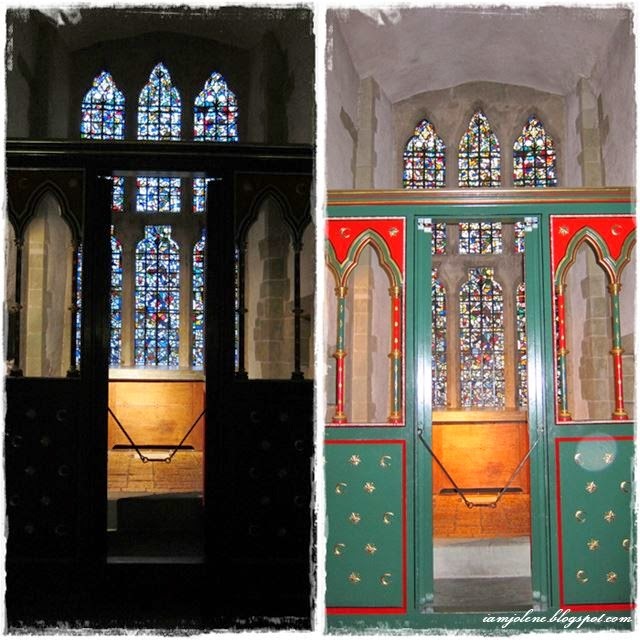 Let us take a peek at King Edward I's room. 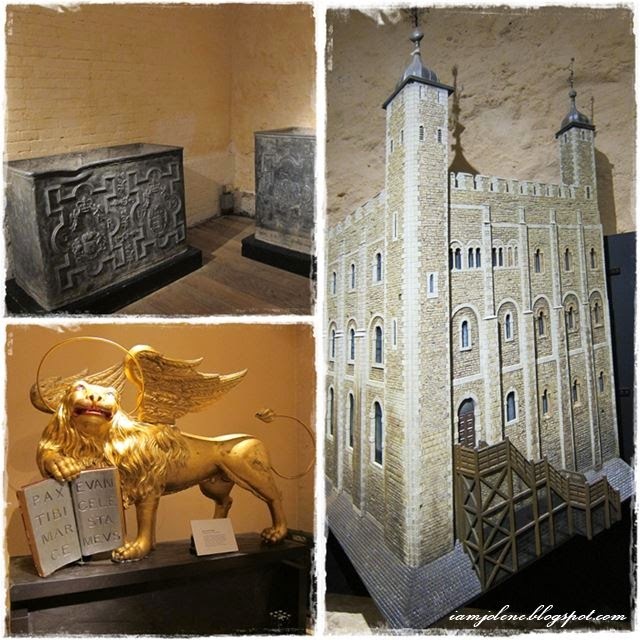 A recreation of King Edward I’s (1239-1307) bed was displayed in St. Thomas's Tower. The King’s bedchamber was recreated as it might have looked when Edward stayed at the Tower for a week in the winter of 1294, while preparing for war with France. Read more here. It was essential that the King’s bed was easy to take apart and transport as Edward frequently travelled both in this country and abroad visiting his estates and putting down rebellions. The chains and rails came down, the four posts were pulled out of the dais (raised platform), curtains were thrown into leather sacks and the whole lot transported on carts or horseback. They seemed to be playing a sort of game. I don't know what this is but I like the stained glass window at the back actually. Looking out to a view of contemporary scene seemed almost surreal especially when we seemed to be enslaved in time within the confines of the various towers. What juxtaposition of modern glass buildings with medieval stones. Us with The Lost Palace as backdrop. Although some of the lost towers have largely faded from the public consciousness, London was the location of several other royal palaces in the past, and you can still find fragments of them if you know where to look. Fragments we saw none, only lawns of green. Into the Salt Tower we went. The ground floor of this tower would have been used for storage. Archers would also have stationed here if the Tower was under threat. The Salt Tower had a very ominous presence about it. According to legend, dogs refused to enter the Tower. Another legend has one of the Yeoman Warders being nearly strangled by a unseen presence. No one would go in the area after dark, for fear of the evil presence that haunts the Tower. I'm getting the shivers typing this. We found this notice at the Constable Tower highly amusing. Would the ghosts of the 14th century please step forward? Being enthralled by morbid stuff, I stared at this display for a good full minute. The Royal Menagerie was founded during the reign of King John in the early 1200s. Animals lived at the Tower for over 600 years. Exotic animals were given as royal gifts and animals were kept at the Royal Menagerie for the entertainment and curiosity of the court. After the sun set at close to 4pm, it got really chilly. When it grew dark, the tower grounds also looked more haunting as exemplified by these pictures. This grass lawn looked really calming though. I wondered how long we would spend walking the tower grounds if we weren't there during winter. The short days seemed to give a false impression that night was approaching too soon. 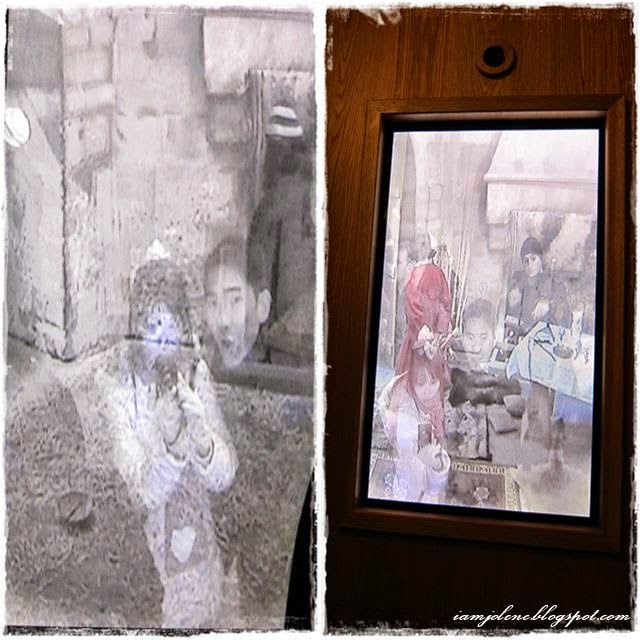 We could have easily spent an entire day walking through every room, passageway, and museum. It was truly that fantastic. 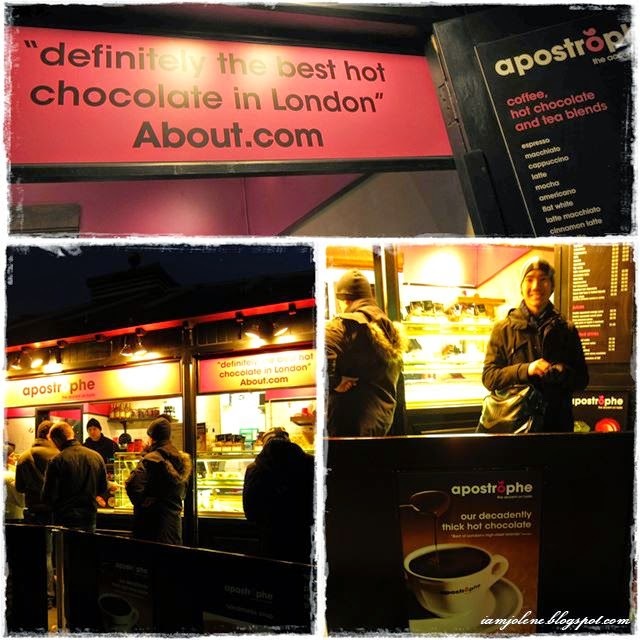 However, the winter cold got the better of us and what was more inviting than a cup of hot chocolate! I always crave for soupy dishes when cold but it seemed like there were not many dining options around the vicinity. 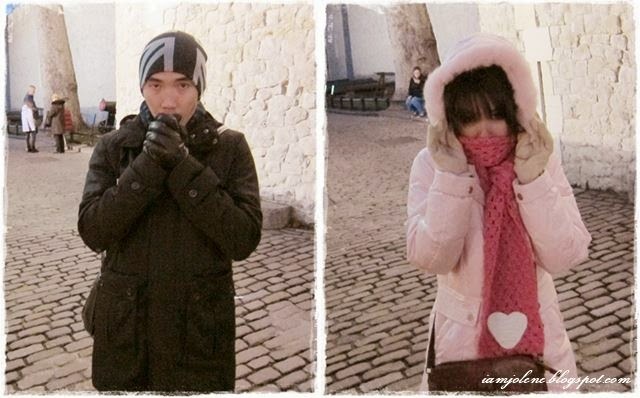 We were literally cold, tired and hungry and did not want to venture any further for food. 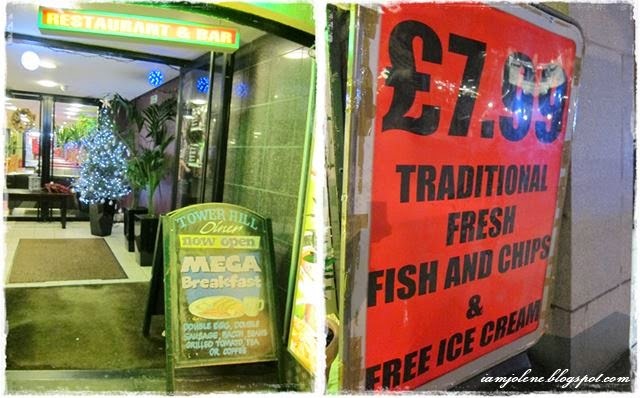 £7.99 for TRADITIONAL fish and chips sounded good too! 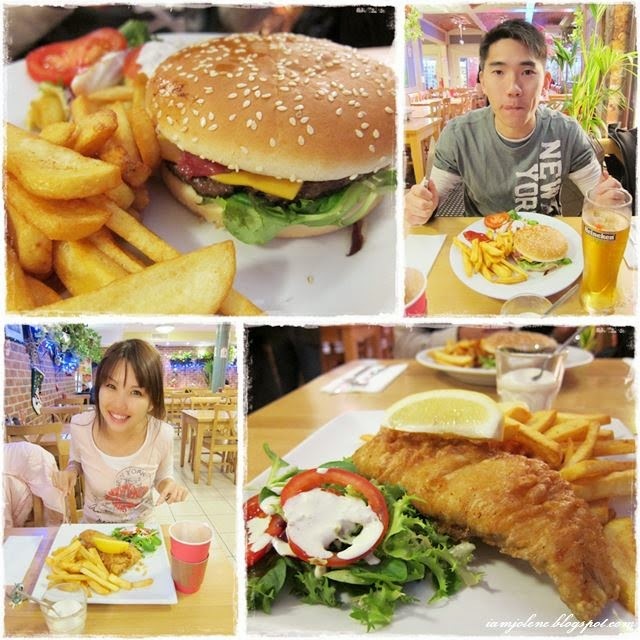 After all, fish and chips originated from England and we wondered about how authentic it would be. Chi Cats joined us at Tower Hill Diner for dinner looking all tired as usual. Dinner served! Traditional or not, I did not care. ITADAKIMASU! I would get busy again and I'm trying to get this post up asap. I reckon there would be awkward expression lots of, unfortunately grammatical and speelling errors, and unforgivable editing. Make do with this version first while I slowly proofread my post some other day. Next London instalment would be a really short post on our night stroll at Winter Wonderland in Hyde Park.